Contemporary landscaping design takes the architectural features of the residence and surrounding location into careful consideration. The resulting garden stands in harmony with the home and thrives under the particular sun, terrain, and water conditions it finds there. Magic Gardens Landscaping brings 35 years of plant knowledge and construction expertise to Bay Area garden design. We know well the subtle differences in microclimate and terrain which make the East Bay a unique, fertile land for a wide variety of plants and garden features. Our gardens reflect a deep care for custom landscaping that fulfills the homeowner’s vision and provides lasting beauty to the community. With Magic Gardens Landscaping, there are no default templates. We listen carefully to our homeowners’ wishes and ideas for the perfect garden and grounds and do a thorough assessment of their land. Based on their valued input and our understanding of the local microclimates, we offer sketches and suggest potential features and landscaping layouts. It’s a collaborative, open process that is truly satisfying for our customers. Some homeowners worry that their land is too difficult to accommodate a beautiful garden experience. 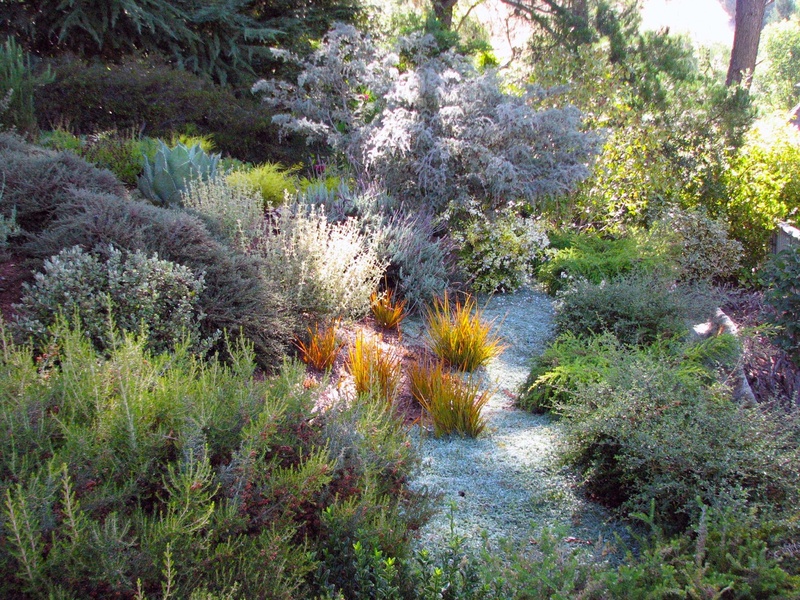 Steep slopes, fog, all-day shade or hot open sun challenge many East Bay homeowners when it comes to envisioning a beautiful, enjoyable garden. Magic Gardens Landscaping brings solutions to exactly these types of challenges and can show you how the land may be sculpted to suit your vision while still maintaining harmony with its natural surroundings. Magic Gardens Landscaping’s master landscaper Aerin Moore sees the garden as a collection of satisfying experiences. That means each stepping stone, each seat on the patio can provide a new angle from which the garden may be enjoyed. Stone elements greatly enhance the texture and sense of structure in a garden. Landscaping with pavers opens a wide selection of materials, including brick, tile, natural rock, and shaped cement. Our top-notch masonry team can transform a steep slope into an enjoyable series of terraces by landscaping stone walls, which provide wonderful texture and visual levels to any garden space. These walls need not be restricted to traditional styles; low walls for landscaping flower beds bring a polished look and are easy to maintain. Water adds a sensual and sense-reviving calm to any garden. Water features should exist harmoniously with the surrounding design and function reliably for years to come. Whether landscaping waterfalls against a back fence or fountains in the center of a paved courtyard, master landscaper Aerin Moore and his efficient construction team continue to amaze homeowners with the care and consideration of each design. I had a limited budget and a very ugly garden, abused for years in the Montclair hills. Aerin worked on an innovative design that incorporated what was already there with some alterations. The crew was working at full tilt – and a happy, helpful group they are! Details were meticulously attended to, they cleaned up every night and I was brought in on decisions during the course of the work.